What should you do if the person you're with suddenly stops breathing and has no pulse? If the patient is under medical care but is not terminally ill, you must act immediately by applying the life-saving technique of cardio-pulmonary resuscitation (CPR). CPR is a means of maintaining breathing and blood circulation during a crisis situation in which the patient cannot continue these functions on his own. Use CPR when a person is unconscious and not breathing, and there is no pulse. Immediately tell any bystanders to call 911. 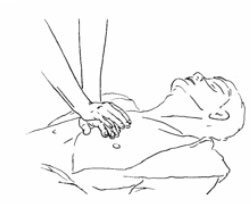 First lay the person on his back on a hard surface; then begin applying the ABC's of CPR. Airway: Tilt the patient's head back to open the airway. Breathing: Breathe into the patient's mouth with four quick breaths. Pinch the nose shut while doing this. 1. Find the pressure point over the heart, which is about one and one half inches above the sternum, or breastbone. 2. Press down on the pressure point with the heel of your palm so that it compresses the chest 1 1/2 to 2 inches. With a smooth, steady rhythm, press down fifteen times within the period of approximately twelve seconds. 3. Now check for a pulse or breathing. If they are both absent, begin the sequence of Breathing and Circulation steps again. CPR must be continued until medical help arrives to take over. It is easier to sustain the rhythm if CPR is performed by two people: one for pulse-taking and heart massage and the other person for mouth-to-mouth resuscitation. To learn proper techniques and procedures to be followed in special types of emergencies, you should take a certified CPR course, available through your local branch of the Red Cross, your fire department, or a community agency such as the American Heart Association. 1. For a standing or sitting patient, make a fist, with the thumb and index finger forming a knob. Press this knob directly against the patient's stomach, above the navel, but below the sternum, or breastbone. 2. With your free hand, reach around and grab your fist. Press the fist up and into the stomach with a sharp thrusting motion. Be sure to make this thrust by bending both elbows, not by hugging the patient. A strong hug can crack ribs. 3. If the patient is lying face down, roll him onto his back. Make sure his head is raised in order to clear his airway. Place one hand on top of the other with the heel of the lower hand against the patient's stomach again between his navel and sternum. Press into and up against the patient's stomach with a sharp thrusting motion. 4. For both the standing and lying Heimlich Maneuvers, the thrust may be repeated several times, if necessary, until the patient can breathe, returns to consciousness and normal color. If the technique does not seem to be working, immediately call 911 for help. Tell the person to concentrate on relaxing-anxiety makes the short-of-breath feeling worse! If breathing difficulty continues, call 911. A person who is short of breath, perspiring, and complains of severe chest pain may be having a heart attack. Call 911 at once! While waiting for help, check the patient's pulse regularly. Keep track of its rate and strength so that you can report it to the emergency medical workers when they arrive. Although very frightening, shortness of breath often passes in a few minutes. The first thing to do, if you can, is sit up straight, so that your lungs can expand fully, loosen restrictive clothing such as tight collars or bras, and concentrate on relaxing. Remember, anxiety can cause you to feel (or add to the feeling) that you're not getting enough air. Conserving energy is one way to prevent shortness of breath. Plan your steps-for example, keep frequently-used items such as the phone, clock, pad and pencil and your snacks within easy reach of your bed or chair. When you are less active than usual, your lungs don't expand as fully as they normally do, unless you make an effort to help them. Coughing and deep breathing exercises should be built into your regular exercise routine. While you are in the hospital your respiratory therapist can teach you some easy exercises; for example, as simple a maneuver as blowing up a small balloon can greatly expand your lungs. If difficulty in breathing persists, call your doctor and consult with him about what other measures can be taken to relieve it. In extreme situations, do not hesitate to call 911. Severe bleeding is another emergency to be prepared for. In case of a deep cut, keep the area clean and apply pressure. Try applying ice in a pack or plastic baggie directly to the cut. If the bleeding does not seem too serious, you may bring the patient to the hospital yourself but call the emergency room first for advice. Serious bleeding of an arm or leg may mean that a major artery has been cut. You should apply firm pressure to the cut and call 911. For any major cut, keep the patient quiet and do not attempt to move him until the medical help arrives. Nosebleeds are sometimes frightening, but they can be treated easily. The patient should squeeze his nose, lie down, and rest for a few minutes until the blood clots. Ice in a pack or baggie applied to the nose will minimize bleeding while the clot is forming. An accident or fall is the final emergency situation we will discuss here. You can deal with this crisis best by checking quickly to see if the patient seems to have broken any bones. The most obvious sign of a broken bone is an arm or leg that appears bent into an unusual position. Other bone breaks are not so obvious and may need to be determined by x-ray examination. If you suspect that a bone may be broken or fractured, don't attempt to move the patient -- call 911. If the patient has neck or back pain, or has difficulty moving his fingers or toes, there may be a neck or back injury. In this case, it is Extremely Important that you not move the patient before medical help arrives. In the meantime make the patient as comfortable as possible. Carefully place a pillow on either side of the neck and keep the patient from moving his head.